Trying to make downshifting uplifting! Project Calendar: the handmade rather than hand-into-purse approach! Mad March: giving the gift that suits everyone? March is so busy with birthdays – some long-established and a new one due to arrive in the month, as well as Mother’s day in couple of weeks, so I’ve had to start early on getting the month organised (although we’re already a week into it)! Minor achievement is that I actually finished a little something today, which I’ve put over on the project calendar – a phone cosy as part of the gift for a good friend, so that’s one thing down and about six more to go! Seriously, it has to be said though that because we need to be pretty frugal I’m trying to balance between home-made gifts and things that people actually want / need / have asked for and to be honest sometimes it can be a little hard to achieve the balance needed. There’s lots of inspiration out there (I’m aiming to build a blog list of inspiration to share at some point) but I’m intrigued as to how others of the frugal fraternity manage to give the ideal gift that suits the occasion and recipients’ tastes, needs and wishes along with suiting your own pocket (especially when that pocket’s a little empty). 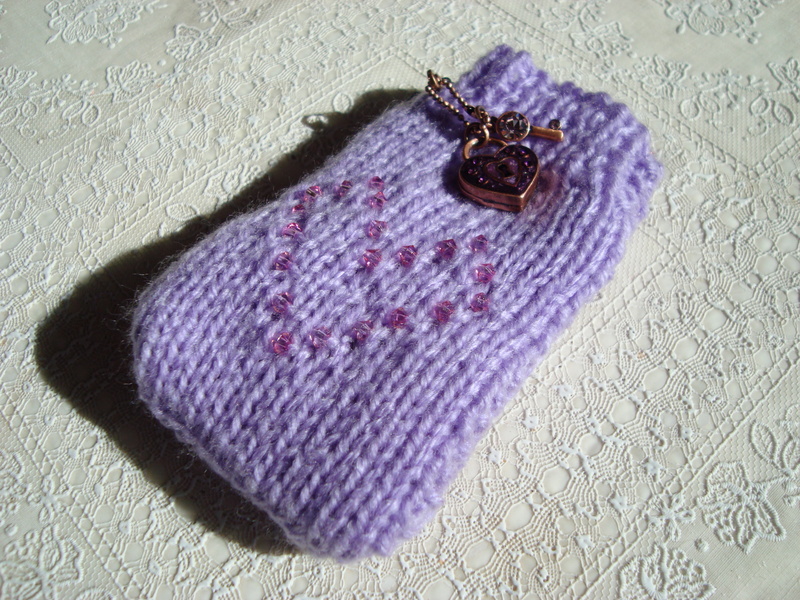 I’m lucky to be able to knit so many of my gifts take a knitted form – today’s phone cosy being yet another example, and I do have some crafty leanings, which I think helps. I’m also a bit of a perfectionist so I don’t want to give anything that is of below ‘shop-bought’ quality and I pay special attention to this when I am making things – I figure that what I’m not putting into the present in terms of ‘fiscal’ cost, I more than make up for in time and care. But how far can this go when producing things for others who may not be of the same mind-set? My friends and family are all understanding of my change of circumstances, but is a home-made / frugally-sourced gift possible for every occasion and every person? Of course, necessity being the mother of invention or such, my last question is something like a challenge really, so to all of you out there – is it really possible? Obviously I’m going to end up following this challenge as the year progresses and perhaps at sometime I’ll sort out an overview of the inspiration and ideas I’ve gathered, but I’m genuinely interested to know how (and if) others manage to achieve a balance with frugal gift-giving! Hurrah! Himself has decided that we should take up the offer of the half allotment as a temporary plan B (reference The Quest), so it’s all systems go when the rain stops! He’s hoping that being part of an allotment community will give us access to group discounts on seeds and whatnot, whilst I’m hoping that it’ll give him another place to stick his free manure (as it were)! I am pondering the kind advice in respect of the gift that belongs to another, and I am considering opening it on my birthday next week, in the absence of any further correspondence from the mysterious Giles! Incidentally, is it just me or is Giles a bit of a let down as the name of a man sending mystery gifts -shouldn’t he be more of an Adam, or even a Clint or Heathcliff ? Apologies Giles Coren and anyone reading this who’s called Giles or has bestowed this name on their son, but it just doesn’t fit the persona I appear to be creating here as I ponder the mysterious delights of the postal system! Save £223 – and make a ‘Killing’ of your own! 13th …. a funny old day! Sometimes it's just about stopping and looking around, to get a perspective on things! THE PECULIAR MEMORIES OF THOMAS PENMAN by Bruce Robinson - this one's going on the favourites shelf! DOWNSHIFT TO THE GOOD LIFE - Lynn Huggins-Cooper: not a favourite! THE NEW COMPLETE GUIDE TO SELF SUFFICIENCY - John Seymour: the original inspirant of TV's The Good Life (if you remember it)! Good book, lots of handy hints and tips, but assumes you have land to play with. 40p charity shop find- what a result! I didn't get on with Withnail and I, but I love this book!